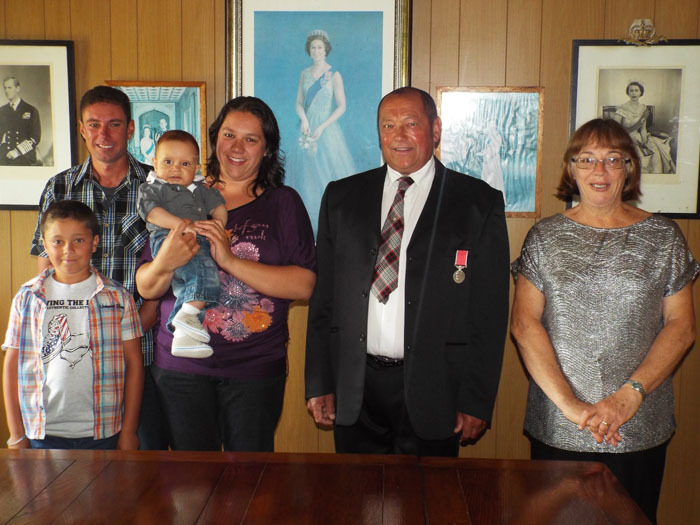 News for 2015 from the Tristan da Cunha community. Ryan, Nicky, Tyler and his daughter Emma Swain, Dereck, and his wife Hilary. 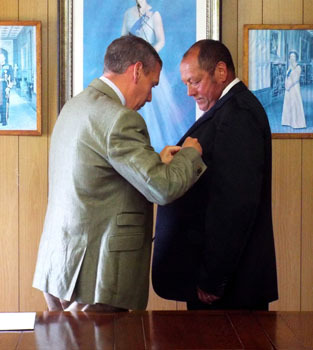 Alex Mitham pins the BEM on Dereck's jacket. See Dereck Rogers BEM for more on Dereck's deserved award. in front of her portraits hanging in the Tristan Council Chamber . 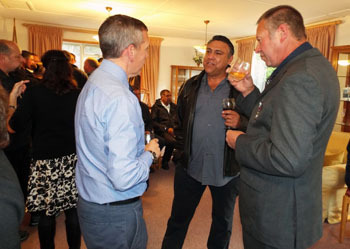 On the 30th October we held a reception in honour of Neil Swain as he has recently been recognised for his services during the Falklands conflict and been awarded the South Atlantic Medal . 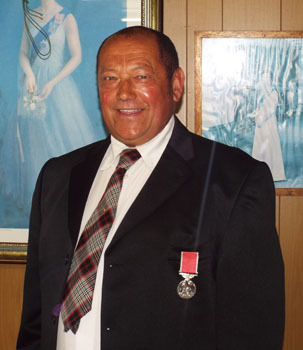 During the 1982 conflict Neil and Julian Swain decided to join the Merchant Navy, and help those in dire need on the Falkland Islands. 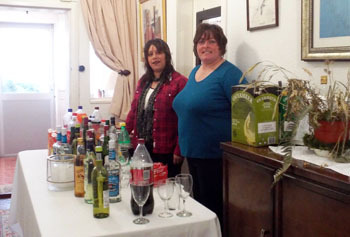 They made the long journey up to Ascension and signed on as crew aboard the RMS St Helena, taking down essential supplies to the Falklands and to South Georgia for over nine months. The South Atlantic can be rough, and they made that journey many times, serving in very difficult conditions, with the ship always blacked out at night due to enemy aircraft. When Neil went to South Georgia to help in a sensitive military salvage operation, he faced increased risks, including the threat of attack and the dangers of ice bergs as well! 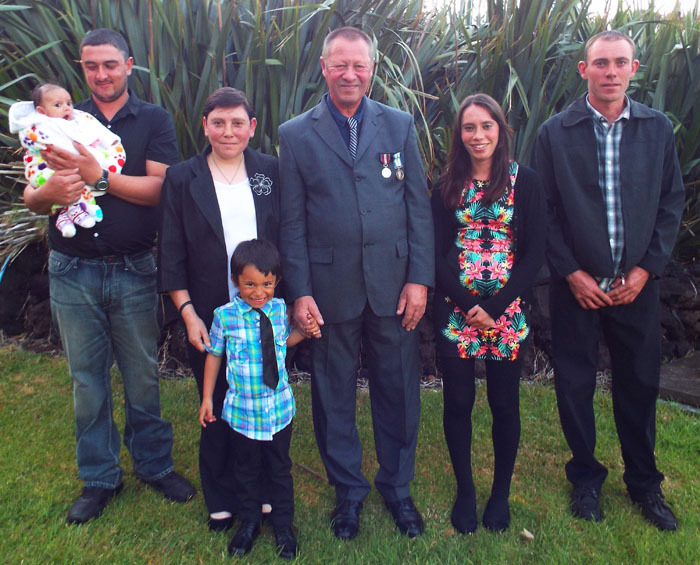 It takes a great deal of dedication and courage to join the Merchant Navy during times of conflict. The RMS does not have the same protection as a Royal Naval vessel. Neil and his fellow crew mates were out at sea, alone and defenceless. That takes real bravery. 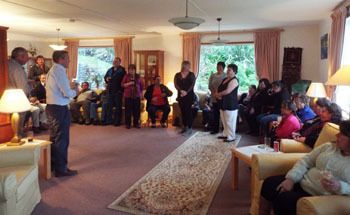 The UK, Falkland Islanders, as well as this community owe Neil a great debt of gratitude. 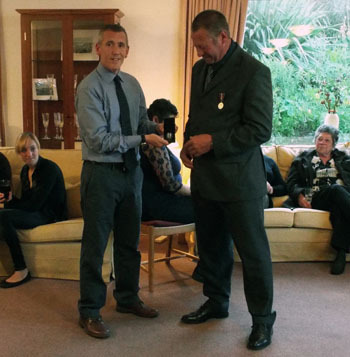 Congratulations to Neil on receiving this well deserved Medal. 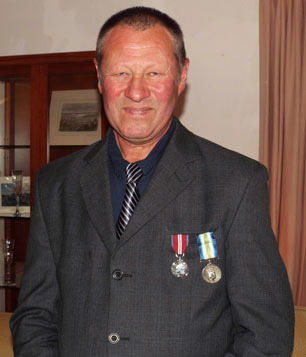 The South Atlantic Medal is a British campaign medal awarded to British military personnel and civilians for service in the Falklands War of 1982. Other recipients of the medal include Prince Andrew. Altogether almost 30,000 men and women have been awarded the South Atlantic Medal for their part in the war, including some 7000 members of the British Army, 2000 Royal Air Force personnel, 13000 from the Royal Navy, 3700 Royal Marines, 2000 members of the Royal Fleet Auxiliary and 2000 who were either civilians, or like Neil, in the Merchant Navy. with, front, Alex Mitham, Conrad Glass and Neil Swain. 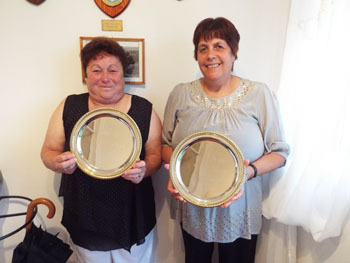 On the evening of 30th July 2015 the island community held a small reception in honour of Marlene and Yvonne - recognising their half a century of teaching. The evening was about celebrating two ladies who have dedicated their working lives to educating others.Miss Marlene worked at St Marys for 48 years, while Yvonne retired after 50 years service – that is almost 100 years combined of teaching excellence and dedication at St Mary’s School. They say – ‘to teach is to touch a life forever’ – well both Marlene and Yvonne touched every child's life on Tristan for half a century.It is an astonishing achievement - not only in committing so much of their time to helping so many, but also in their sheer enthusiasm and perseverance in ensuring children get the best education they deserve. The continual rise in educational standards is thanks in no small part to Marlene and Yvonne, as well as all the teachers at the school, past and present. I Know they will be (and are already) sorely missed at St Mary's – they really will be a hard act to follow, setting quite a benchmark to achieve. However with any luck in a few years time we may be celebrating more half century’s in teaching! 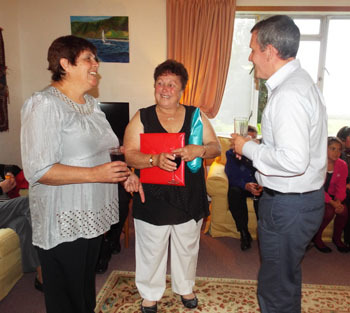 The island thanked them for everything they have done to educate generations of students on Tristan, and presented them with engraved plates to celebrate their achievement. 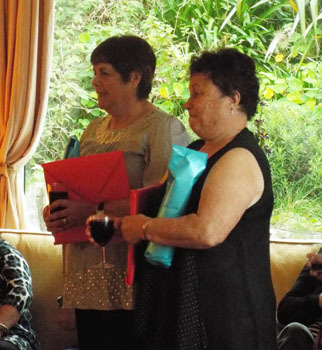 Miss Yvonne and Marlene – thank you for half a century of teaching! 48 and 50 years service to St Mary's School and Tristan education . retirements on the School News Page. A ceremony was held in the Council Chamber on 13th July 2015 when Finance Officer Chris Standing and Michelle Campbell presented certificates following successful training in Sports Massage Therapy. 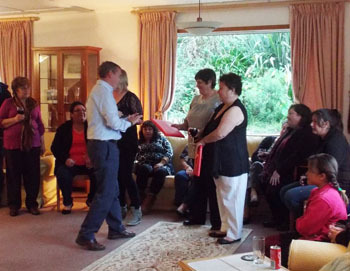 The photo shows, left to right, Michelle Campbell, Chris Standing, with the successful recipients Sharon Glass, Sarah Glass and Desiree Repetto with their certificates. 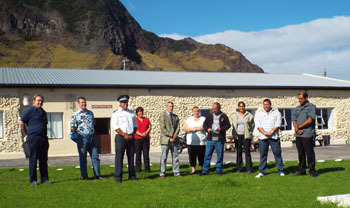 The Tristan da Cunha community was affected by an outbreak of a bacterially spread form of bronchitis during April. Acting Administrator Chris Standing issued a Public Notice on 8th April announcing steps to control and prevent the spread of bronchitis symptoms which included taking oral antibiotics, advice on hygiene, and limiting social and business gatherings. Camogli Hospital has had the benefit of both Dr Anja Smit and Dr Wei Chung Ip during this outbreak and the community has responded to advice with typical calm and support for one another. Non-essential Government and factory work was shut down for a few days as a precaution to stop the outbreak spreading, the school closed and Church services were cancelled on Sunday 12th April. No Tristan fishing or processing occurred during the outbreak. The 2014/15 fishing season ends with the 28th April departure of MV Edinburgh without the agreed quotas being caught. The Tristan community has often been affected by virus brought by incoming visitors aboard ships. So as not to put passengers of cruise ships at risk of contracting this bronchitis condition, no passengers came ashore from MV Plancius (which cruised Tristan waters 10th-12th April) or MV Ortelius (that called on 13th April), but island RIBS went out to both ships and were able to collect additional medicines which were running short on the island. Further support was sought to secure medicines, and thanks to help from DFID and the MoD the Royal Fleet Auxiliary vessel Gold Rover was re-routed and arrived at Tristan on Tuesday 28th April with the medicines. Administrator Alex Mitham, presently in the UK, was able to co-ordinate this wonderful assistance. He wants to highlight the Tristan community’s sincere thanks and appreciation for this prompt and important mission which ensures there are adequate supplies now in the pharmacy. 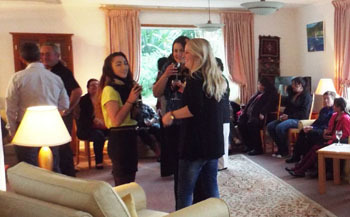 Alex clarified on 28th April that the island is over the bronchitis problems now, and an example of this is that St Mary's School had its usual full complement of pupils on Monday 27th April. He would like to thank Acting Administrator Chris Standing, Dr Anja Smit and the islanders for all their hard work in tackling the situation so quickly. They did a tremendous job. 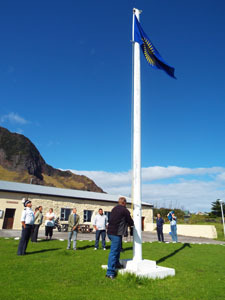 Chief Islander Ian Lavarello raises the Commonwealth Flag on the Tristan flagpole. The Commonwealth Flag was raised at 10.00 on Commonwealth Day, Monday 9th March 2015 by Chief Islander Ian Lavarello. As Administrator I read out Her Majesty's well wishes and Ian delivered the Commonwealth Affirmation to the assembled Island Council. Owing to the numerous projects and other work being carried out on the island, I am immensely grateful to the Island Council for taking the time to attend the event, and for Tourism acting as the official photographer. Being the remotest inhabited island in the world, we feel honoured and very proud to be a part of the worldwide Commonwealth community and wish to extend our warmest regards to every country involved. The values of the Commonwealth are very much close to the community's heart, and it has been a wonderful experience to be part of such an important occasion. 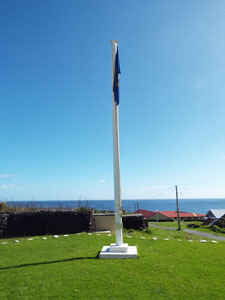 Thanks also to Bruno Peak, Pageant Master 'Fly a Flag for the Commonwealth' who provided Tristan with the Commonwealth Flag to include the island community in a commonwealth celebration for the first time. We need more Commonwealth days as the weather was perfect! 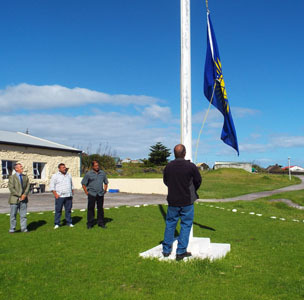 A very rare day on Tristan when a flag lies undisturbed by wind as Island Councillors, Administrator Alex Mitham and his ex-pat colleagues look on.